Her Last Breath by Linda Castillo What at first seems like a tragic, but routine car accident suddenly takes on a more sinister cast as evidence emerges that nothing about the crash is accidental. But who would want to kill an Amish deacon and two of his children? 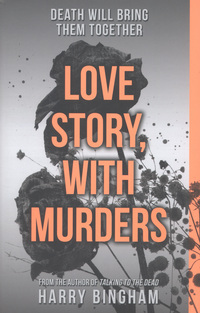 Love Story, with Murders by Harry Bingham The psychotic DC Fiona Griffiths is dealing with as intriguing a pair of murders as you could imagine. Part of a human leg is discovered in a woman’s freezer- Other similarly gruesome discoveries follow throughout a cosy Cardiff suburb, with body parts turning up in kitchens, garages and potting sheds. And while the police are still literally putting the pieces together, concluding that they all belong to a teenage girl killed some 10 years earlier, parts of another body suddenly start appearing.. Killing Grounds by Dana Stabenow Alaskan detective Kate Shugak, working as a deckhand on Old Sam Dementieff’s fishing boat Freya, finds a body in the water. It’s a fisherman who has been beaten, stabbed, strangled and drowned. Overkill. But why? The Stranger you know by Jane Casey He meets women. He gains their trust. He kills them. That’s all Maeve Kerrigan knows about the man she is hunting. Three women have been strangled in their homes by the same sadistic killer. With no sign of a break-in, every indication shows that they let in their attacker. But the evidence is pointing at a shocking suspect: DCI Josh Derwent, Maeve’s colleague. Maeve refuses to believe he could be involved, but how well does she really know her partner? Blind Justice by Anne Perry Oliver Rathbone, William Monk’s close friend, has presided brilliantly over his first cases as a judge. But the next will bring a far greater challenge. Abel Taft, a charismatic minister adored by his congregation, stands accused of terrible corruption and fraud which has ruined the lives of those he’s betrayed. In court, each victim affirms Taft’s guilt, but when the defence’s star witness tears their stories apart, the case seems lost. Rathbone realises he holds a piece of evidence that could change the outcome of the trial and bring true justice, but can he, as the judge, become involved?